Below, you can find a few example of my recent research projects. I seek to better understand the role of the Visual Communication Designer (VCD) in an increasingly complex digital professional landscape. I am seeking to identify how the evolving deliverables (e.g. mobile platforms, wearable computing, ubiquitous computing environments) and production environments in our field impact the curricular goals of VCD students. My research is two-pronged, focusing on both advancements in industry and the curricular ramifications of those advancements. The next phase digital visual communication design will move beyond the screen and start to become integrated into our physical spaces. There are a lot unknowns as we venture into this space. For instance, how might we improve visual communication design or user interfaces once we know more data about the viewers. The question that strikes me here is: "how can a UI improve my experience when it knows I am looking at it?" My research agenda—focusing on design's transition to digital platforms—has naturally taken me in this area. My first formal research in this area utilizes RFID sensors to customize text for each viewer. I have written a chapter in the forthcoming book Spellbound: Rethinking the Alphabet about this topic. There are many other avenues I am exploring in the overlap of VCD and ubiquitous computing, including curricular ramification. The field of Experience Design (XD) and its subsets (interaction design, service design, spatial design, etc.) is growing in both size and complexity. 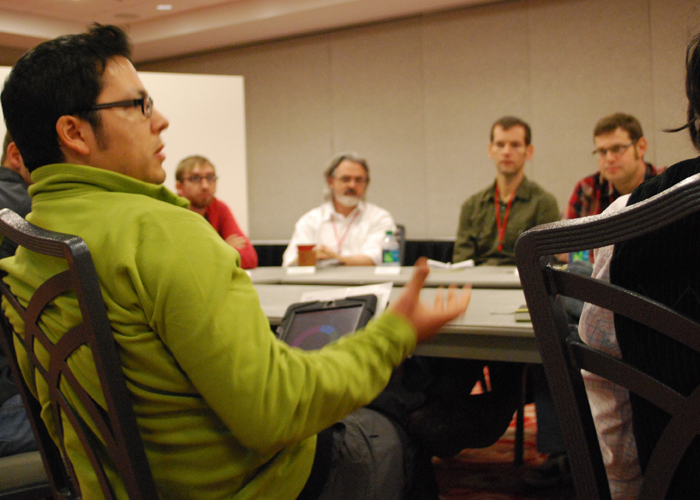 Experience Designers are starting to influence an ever-increasing scope of problem spaces. To be successful in today's XD industry, designers must simultaneously approach problems from a broad, system level and a micro, tangible level and produce strategic design solutions, which are frequently involve the integration of many smaller deliverables. Being influenced by cultural and social understanding of design, students tend to regard design as what they will make. This perception, with heavy focus on solution phase in designing, causes a fragmented view in design education. In order to expand students’ integrative understanding of design, I have introduced a framework that is based on the tiers of human experience when engaging with design. An example of a visual narrative that my students use to describe real world problems. Empathy is an important characteristic for designers to strengthen. With this in mind, I am seeking ways to teach and assess empathy within a design curriculum. I have done this recently in two projects. The first is centered in assignment design. In that assignment, participatory research activities are integrated into traditional web design projects. This process helps introduce methodological thinking and elicit empathetic characteristics in students. Students must define problems that effect real people and craft solutions for those problems. 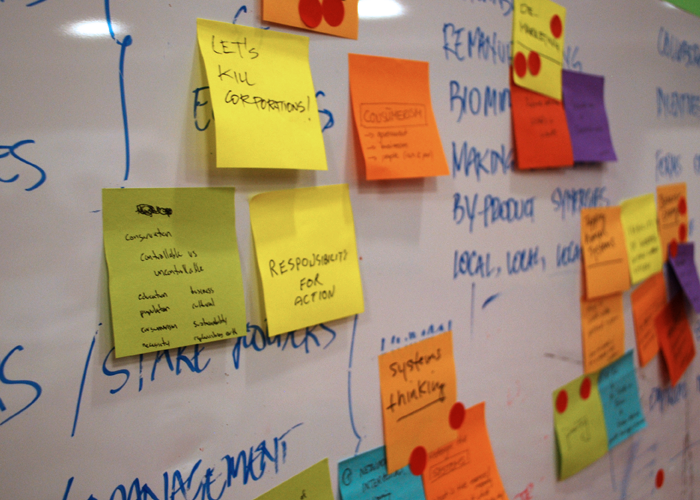 A paper was published about this work titled "Finding real problems: Using participatory design research to help students propose and design new applications." You can read it here. The other ongoing project related to empathy is being facilitated by a collaboration with IUPUI's Center for Service and Learning. 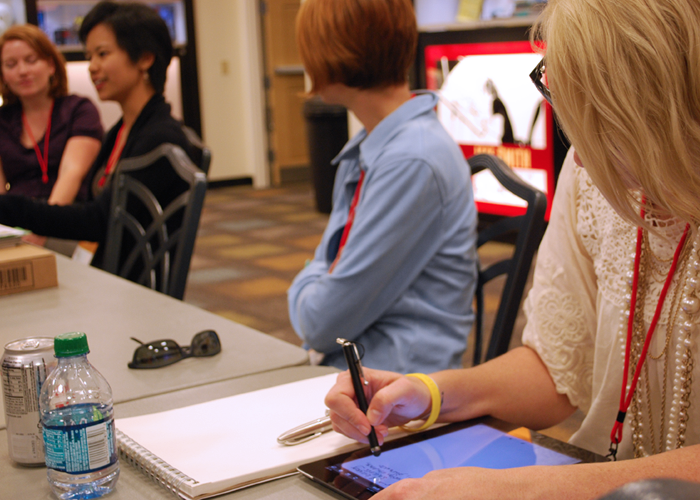 An assessment method is being developed to help document students' ability to tap into empathy when designing. 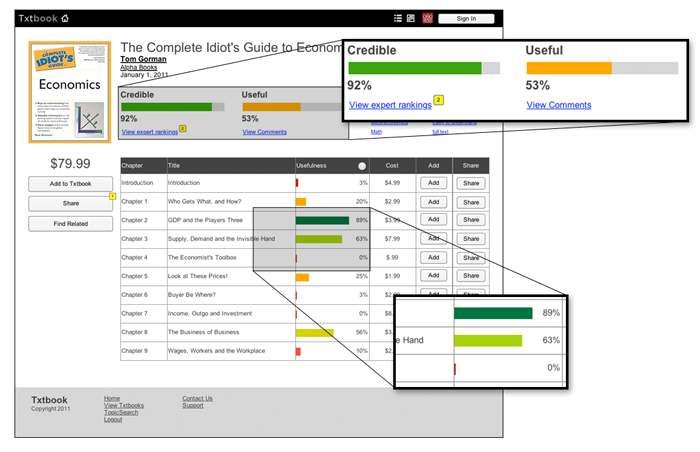 This assessment tools is being developed in the context of an senior-level Service + Interaction Design capstone course. A service learning pedagogy is being utilized to help students better understand their civic identity and to allow them to work for and with real people. 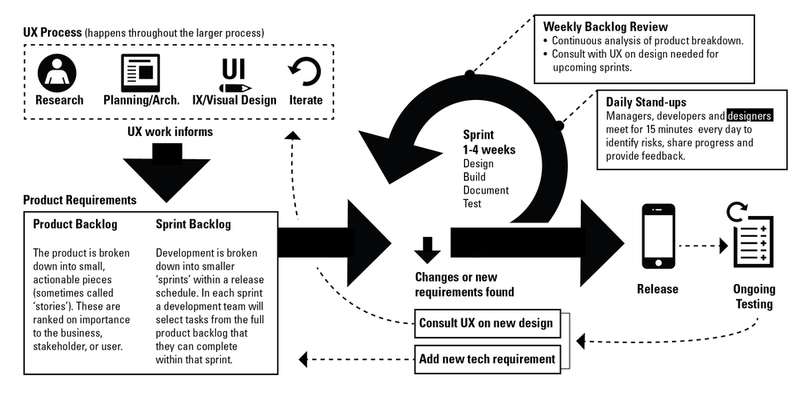 A visualization of design's integration into the larger agile process. Since the proliferation of the commercial use of the Internet in the mid-1990s, visual communication designers have been working more in the interaction design space. Using software like FrontPage (1995) and Dreamweaver (1997), designers were able to develop websites with little or no knowledge of programming languages (Ribeiro 2012). In the 21st century, the field for interaction and web design has grown to become a bigger part of visual communication design activity. According to AIGA/Aquent Survey of Design Salaries 2012, 65% of communication designers are involved in web or interaction design (AIGA 2012). Despite the shift in the professional activities of contemporary designers, little attention has been paid to how their new work environments affect the core skills or knowledge that are needed to be productive in the field, especially in design education curricula. The purpose of the study described in this paper is to better understand industry perspective around the incorporation of visual communication design (VCD)–as one component of the larger user experience design (UX)–into contemporary software development. By revealing current work trends, design educators can better understand the designer’s role and skill requirements in today’s technology industry. Through the methods used in this study, industry experts are enabled to give real-world perspective on how VCD skills and processes are affected by a broadened understanding of the design profession. Conclusions from this work will be useful for professional designers, students, and primarily, design educators. 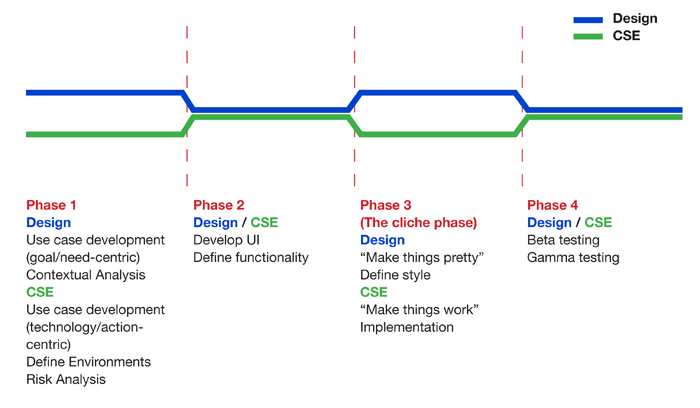 A paper was published about this work titled "Becoming a Team Player: The Evolving Role of Design in the World of Agile Development"
An optimized workflow for collaboration between design and CSE students. Based on the actual professional processes. Because of our increasingly technology-enabled society, computing-supported interactions are growing in both number and complexity. Companies are now rethinking their digital presence, creating new online services that require complex virtual environments. As a result, designers are now required to align themselves closely with computer science engineers. To create truly useful and successful applications, a wide variety of specialties is now necessary. For the foreseeable future, design's success will be closely tied to the success of our computer science colleagues. The design profession has struggled with this paradigm recently, grasping for a way to establish a model for collaboration. The recent proliferation of agile methodologies in professional development communities has proved very successful in generating new collaborative environments. These environments provide a space for many roles to have an impact on a solution, allowing everyone to utilize a wider range of capabilities. Working in this manner has proved successful because of an alignment and tight integration of project goals between business, design and engineering. Proceeding with the hypothesis that collaborative dialogue should be introduced earlier, we set out to define a better educational setting for design and engineering students to work together. In defining a better educational environment, we can establish a place for students to practice working together towards a common goal. A paper was published about this work titled "Exploring collaboration between computer science engineers and visual communication designers in educational settings." You can read it here. 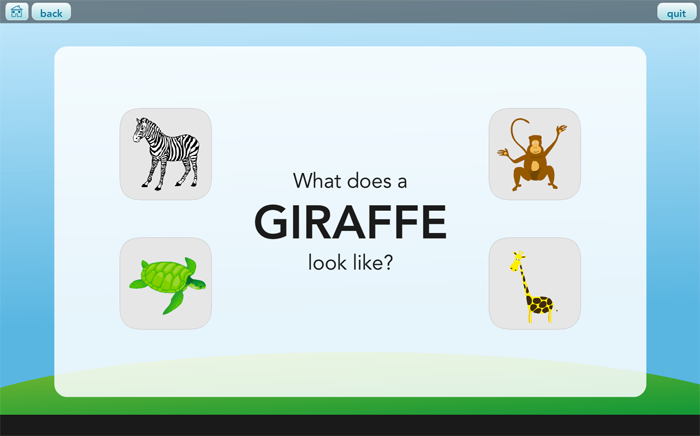 In recent years there have been advancements in digitizing textbooks, however the updates do not utilize the full benefit of available and emerging technology. The way course materials are made and delivered must change systemically in order to stay relevant. The advent of the Internet-enabled classroom and the emergence of "Net Generation" students has forever changed the way that course information is generated and shared. However, a major obstacle to modernizing these materials lies in a disconnect between the needs and abilities of college students and their instructors. By involving both users groups in generative and evaluative research methodologies, a better system can be defined by the users themselves. 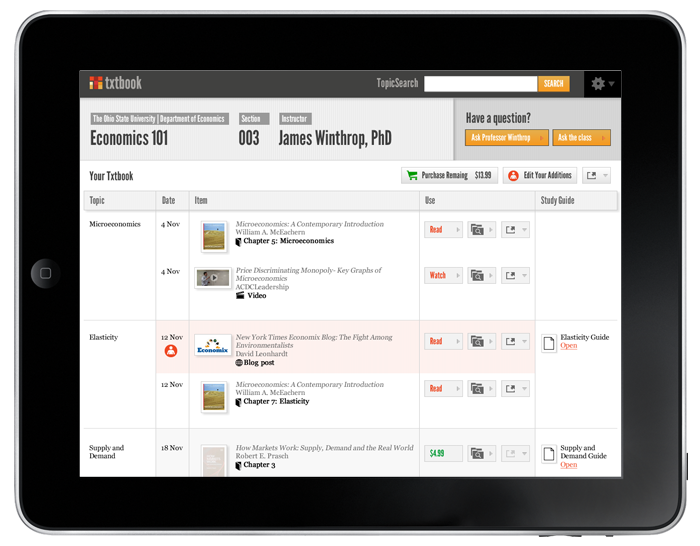 This new system will allow instructors to create, manage, and distribute aggregated content in a way that is comfortable for them. With a focus on usability and flexibility, the system will facilitate communication amongst the academic community and improve the overall quality of college course materials. 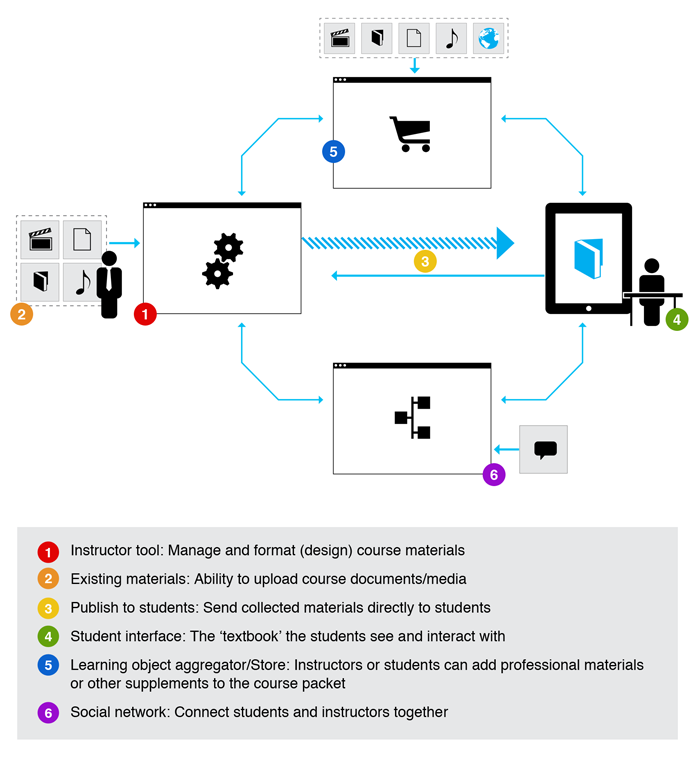 This work was tied to my MFA thesis titled "Redefining the Textbook: A user-centered approach to the creation, management, and delivery of digital course content in higher education" You can view it here. There are also plans in the works to build a prototype of this product to test on Art and Design Foundations students. In 2011, a few colleagues and I became interested in the concept of transdisciplinary work. We were especially interested in how design could act as a catalyst to support work that transcends disciplines. 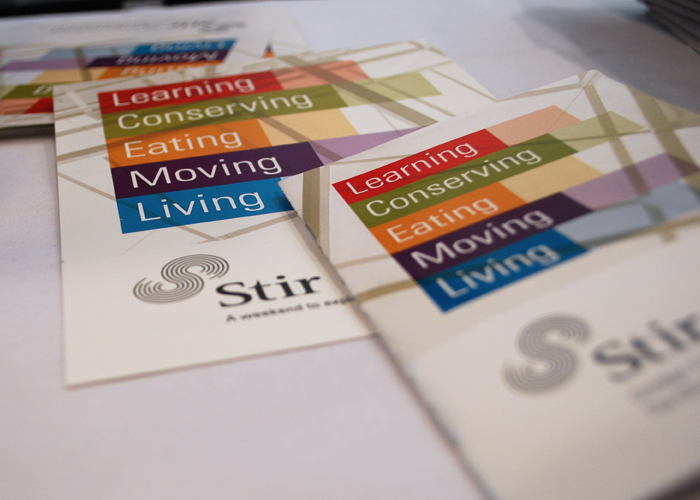 To facilitate our discussion and bring others into the conversation, we created the Stir Symposium. 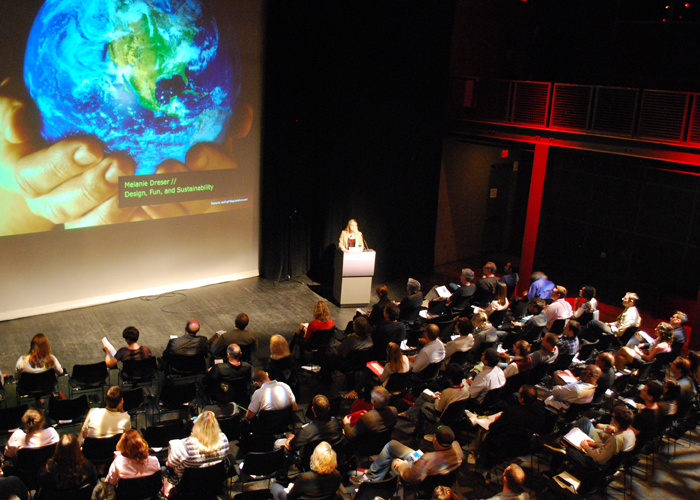 Stir sought to provide an opportunity to collaborate, think, and discover new ways to approach big global issues. Participants from many disciplines brought their own expertise to the table, thereby allowing us all to start addressing problems and issues in ways we never would have thought of on our own. The Stir Symposium was about collaborating and thinking in new ways, no matter the discipline: business, architecture, engineering, design, agriculture, geography, and more. Inspired by design, the goal, and outcome, of the weekend was an exploration of methodologies around this process of working together. 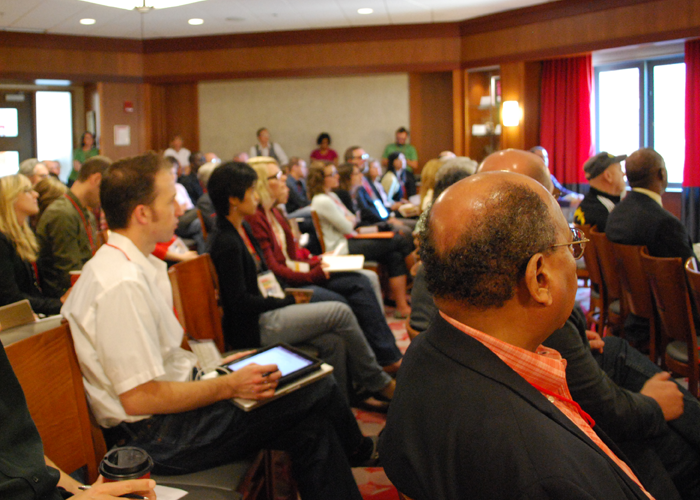 In organizing this symposium, we focused the weekend on topics that demand such a multi‑faceted approach. Participants worked in new ways to address topics such as education (Learning), conservation and sustainability (Conserving), food production and agriculture (Eating), transportation (Moving), and community or city planning (Living). 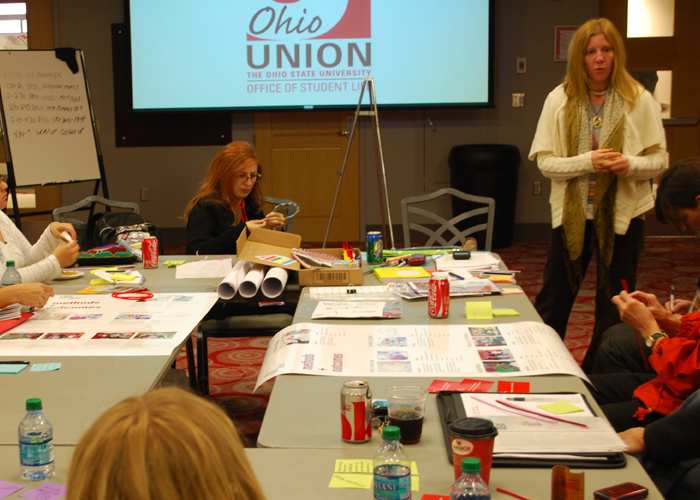 To find out more about Stir or read the proceedings, please visit the Stir website: http://stir.osu.edu/. Children with autism are drawn to technology; it makes them feel safe because it is predictable. However, technology can be isolating for these children because it enables them to escape social situations, exacerbating traits that cause them to struggle in life. By requiring collaborative interaction with the caregiver, we believe our system may lessen the anxiety resulting from learning these difficult skills. It allows the child to practice social and communication skills while using a tool, in this case the HP TouchSmart computer, that provides comfort and safety. 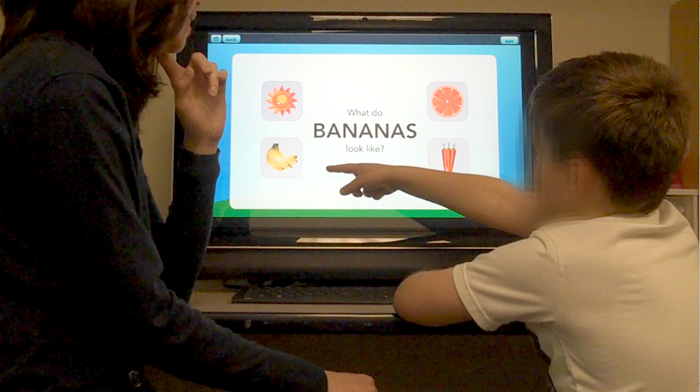 A paper was published about this work titled "Learning through touch: A co-participation interactive learning module for children with autism."